Seeing Batman, Superman, and Wonder Woman on the screen together in live action has already elicited cheers from fans in movie theaters, and that's just from the brief moments in the trailer for Batman v Superman: Dawn of Justice. But there was a time, a time when those heroes in live action did something unthinkable: they smiled, sometimes. 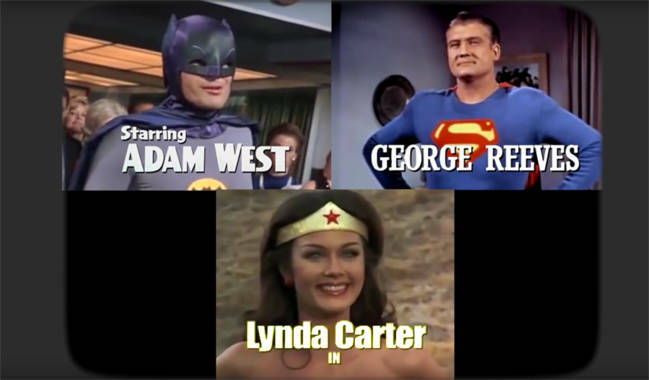 Using the audio from the most recent BvS trailer and footage from classic TV featuring Adam West as Batman, George Reeves as Superman, and Lynda Carter as Batman, this fan-cut trailer by Leo Curbelo shows a very different way for this to have all played out. A few of the bits didn't quite work - like their Doomsday replacement, but any spoof video that features the Batusi automatically gets a couple of gimme points. Batman v Superman: Dawn of Justice stars Ben Affleck, Henry Cavill, and Gal Gadot, and hits theaters March 25, 2016.